The Empty Vessel is a quarterly publication (since 1993) exploring Daoist philosophy and practice in daily life. In Daoism we can find a way of being, a way of accepting, a way of working with change rather than against the changes that life may bring us. Wonderfully illustrative texts such as the Daodejing (Tao Te Ching) and Zhuangzi (Chuang Tzu) offer inspiration, illumination, and expedient advice on life, death and all that lies between. In Chinese medicine we can find cure and comfort for many modern and no-so-modern ills and complaints. With Daoist health practices such as qigong (chee gong) and taiji (tai chi) we can find ways to stabilize and balance our bodies, allowing us to lead long-lasting and healthy lives. Daoist sexual practices can guide us gracefully through the tricky and often dangerous labyrinth of human sexuality. And the practice of feng shui can help us align ourselves with our inner and outer environment. Nei Dan or Internal Alchemy practices can help us reach deeper levels of self cultivation and spritual harmony. With feature articles, essays, art and poetry and interviews with well-known authors and teachers The Empty Vessel explores the philosophy and practices that have come down to us from the ancient achieved masters. 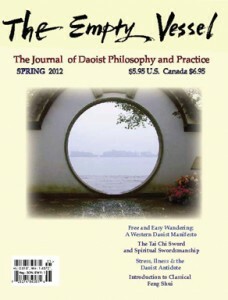 The Empty Vessel, the Journal of Daoist Philosophy and Practiceis published quarterly (since 1993). Covering Chinese medicine, Daoist (Taoist) studies, qigong (chi gong), taijiquan (tai chi), meditation, herbs, martial arts, internal alchemy practice, Yi Jing (I Ching), Daode Jing (Tao Te Ching), feng shui and other aspects of Eastern philosophy. To order a subscription or to order back issues go to our Store section.